INFO - Prepare Self/Neighbors - Quake Up! If you find it difficult to set aside time to prepare for emergencies, you’re not alone. Public surveys list “lack of time” as the primary reason people cite for not taking steps to prepare themselves and their families for a major emergency. Rather than viewing emergency preparedness as an insurmountable task, consider what you could accomplish in just 5 minutes. Below is a list of recommendations from our Take 5 to Survive project list. Make it a team effort and involve your family. Once you meet your goal, celebrate for being prepared for the emergencies ahead! Below are links to a collection of "Take 5 To Survive" flyers that focus on different aspects of preparing yourself and your family for disasters that are common to this area. If you're driving when a disaster strikes, would you know what to do? Learn how to safely respond to a variety of disasters when on the road. Review detailed steps on what to do before, during and after a flood. Flood warning terminology is included. This resource includes information on wind chill, cold related injuries, winter weather warning terms and how to dress in layers for winter's cold temperatures. This resource describes the dangers of thunderstorms and lightning strikes and recommends steps to take before, during and after. Learn the dangers of and the treatment for heat cramps, heat exhaustion and heat stroke. Summer heat can be deadly - know what precautions to take. It's an Emergency! Do You Know Where Your Family Is? Most earthquake-caused injuries are from falling objects. Learn how to secure your home, office and school environments. Disaster-induced stress is a normal reaction to an abnormal situation. know how to provide comfort and when to recommend professional help. This resource points out potential damages from windstorms and outlines what can be done before high winds occur, when they've been forecast and during a high wind event. In a disaster your most immediate source of help are the neighbors living around you. During major disasters, it is common for emergency personnel to be overwhelmed by a number of concurrent calls for service. 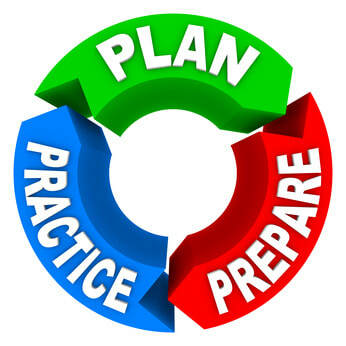 As a result, it is imperative that each household take proactive steps to be prepared in the event of a major disaster. Map Your Neighborhood is that program and has a proven track record. The program was first utilized during the 1989 Loma Prieta earthquake in Sunnyvale, California. During the 2001 Nisqually earthquake, 92% of 460 organized neighborhoods in Seattle reported responding in a timely and organized manner to the needs of their neighbors. Forty-four (44) states, Washington DC, and Puerto Rico have expressed interest in MYN - finding it to be a cost effective and time efficient approach to neighborhood preparedness. England, Indonesia, New Zealand, and Canada have also inquired about MYN for possible implementation in their area. The Map Your Neighborhood Program (MYN) was developed and copyrighted © by LuAn K Johnson, PhD. Used with permission from Washington State Emergency Management Public Education Program. In addition, contributing as an individual and working together as a team helps develop stronger communities and improve the quality of life in the community. (generally neighborhoods = 15-20 urban homes; 5-7 in rural areas and can be implemented in condos and apartment complexes). Teaches neighbors to rely on each other before fire, medical, police, or utility responders arrive. (a 90-minute meeting, facilitated by the program DVD). Statistics show that 70% of all survivors of disasters are rescued by other survivors. The neighbors living around you are your most immediate source of help. Disasters will, strike at any time of the day or night and the reality is that emergency responders will not be available to everyone and may not able to reach you for several days following a major disaster. It may be up to you to save the life of another or you may depend on your neighbors to rescue you or your loved ones. 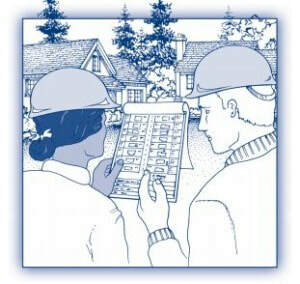 We are vulnerable to a variety of potential risks and it is not “if” but “when”. . . .
Map Your Neighborhood‘s goal is to provide a step by step process to help neighborhoods be better prepared for disasters and know what do afterwards, starting first with evaluating their family and home. Neighbors must be prepared to work together to respond to a variety of challenging situations. Knowing what to do in the first hour (Golden Hour) of a disaster response may save a life or reduce the amount of damage sustained. This includes organizing teams to address immediate needs (injuries, fire, communication, etc.) with turning off gas meters and water valves to putting out small fires and attending to injuries. From the first hour to the days or weeks following a catastrophic event, prepared individuals with their neighbors are, after a disaster, better able to be self-sufficient to survive and recover quicker. Drop, Cover, and Hold On has been shown to be the best method to protect yourself during an earthquake event. We (neighbors) are the responders in an emergency and/or disaster event. Typically, studies show that people do not panic nor think rationally. Our own safety is our number one goal. Protect yourself. Think Safety First! Know where your gas line is at your home and what are the three reasons to shut it off is. Know where your water shut off valve is inside your home to preserve the water heater’s water. Have and maintain fire extinguisher(s) and how to use - P.A.S.S. Decide on your Neighborhood Gathering Site and the Care Center. Neighbors Skills and Knowledge - First Aid, Child Care, etc. Equipment, Tools and Experience - Radios, chain saws, generators, etc. Identify households who may need Extra Help - elderly, disabilities, children, etc. Working in teams of two (2) and staying together and in sight of each other. One (1) records/documents. Fire Safety and Suppression - P.A.S.S. Fire Extinguisher Use - P.A.S.S. Few are born leaders and your MYN Block Captain may change as time goes by. Building trust and accepting differences between neighbors for a higher cause and purpose may take as much as a year or two. This could go fast or start out slow and take multiple meetings in the beginning, due to many reasons. People move at different speeds and the faster ones might inspire others to pick up their pace. Getting everyone on the same page will also take time. It may not be from you, but another neighbor, someone that they know better or already trust. Recognize for some, sharing may not be easy; either with personal privacy and/or belongings. Some people will leave the neighborhood. New people will move in. There will always be change. For the disabled, or elderly, or the single parent, etc., someone else may nee to help them get the things they need to be prepared and/or organized, or ???. A helping hand may be needed . . . .
Map Your Neighborhood is a worthwhile effort. If anything, it helps neighbors get to know each other. Plan. Prepare. Practice. Repeat. Being organized, lessens chaos and increases everyone’s ability to return to normalcy faster. MYN is a proven system and works because human nature is to team up and collaborate together to help others. Some will want to have guns or join preppers or come up with other types of arrangements. MYN simply works! Having and using FRS radios helps in communications and checking in on teams or additional requests. Ability to put out small fires only. Large fires require apparatus and equipment that will not be available. Stay out of harms way. Do not endanger yourself or others. Safety first! Have the walking wounded come out and away from their home if it is too damaged for responders to enter or for them to stay inside. (Examples: the home’s roof has fallen in or the house is leaning over). Also, subsequent earthquakes or high winds could increase the damage and destruction. Safety first! Group solidarity is more prevalent than selfishness as groups of people are more likely to help each other than hinder. “In emergencies, the norm is cooperation.” Selfish behavior is very mild and tends to be policed by the crowd rather than spreading. This is “collective resilience. Why being emergency / disaster prepared in advance is important. How to survive a disaster. In a catastrophic event, most people fail to do the one thing that would save their life, says Michael Bond. People often fail to do things that under normal circumstances would seem obvious. The only reliable way to shortcut this kind of impaired thinking, most survival experts agree, is by preparing for an emergency in advance. Typically, survivors survive not because they are braver or more heroic than anyone else, but because they are better prepared. Check exits beforehand - you may not have the sense to in a crisis. When something goes wrong in a disaster, it affects many people in the same way, at the same time, and in the same place. How should we prepare for natural and man-made disasters? Few people will ever need the advanced survival skills these television programs and survivalist literature showcase, such as stalking and killing wild animals, foraging for exotic plant foods, or fighting off starving hordes of their former neighbors. Worse, shows such as Doomsday Prepper’s misdirect people into preparing for the wrong things. What are the highest-risk emergencies? The Federal Emergency Management Agency (FEMA) lists hurricanes, earthquakes, tornadoes, major fires, and water/electric system failure. Crucial survival skills during such short-term emergencies include thermoregulation (coping with extreme heat and cold), managing fire, making water safe to drink, applying basic first aid, and knowing how to signal for help. The most important survival skill of all? Is being able to work well with other people. Cooperation is part of our evolutionary heritage. We seek out opportunities to cooperate with strangers. Our ancestors were strong, smart people who observed nature closely, who experimented with technology, and who worked together to solve problems. How better to build civic engagement than by enabling citizens to help neighbors in their hour of need? Learning survival skills will not prevent disasters, but doing so will help communities affected by high-risk disasters recover more quickly. John J. Shea is Professor of Anthropology at Stony Brook University on Long Island, New York. Myth: Things are back to normal within a few weeks. Reality: The effects of a disaster last a long time. Reality: Even someone well-nourished would fail to thrive on the monotonous diets of three or so commodities. Myth: Energy adequacy means nutritional adequacy. Reality: The diet needs to be adequate in both quantity and quality, meeting requirements for calories, protein, and micro-nutrients. Myth: Disasters cause deaths at random. Reality: Disasters tend to take a higher toll on the most vulnerable geographic areas (high-risk areas), generally those settled by the poorest people. Myth: Foreign medical volunteers with any kind of medical background are needed. Reality: The local population almost always covers immediate lifesaving needs. Myth: Any kind of international assistance is needed, and it's needed now! Myth: Disasters bring out the worst in human behavior. Reality: Although isolated cases of antisocial behavior exist, the majority of people respond spontaneously and generously. Myth: The affected population is too shocked and helpless to take responsibility for their own survival. Reality: On the contrary, many find new strength during an emergency, as evidenced by the thousands of volunteers who spontaneously unite to sift through the rubble in search of victims after an earthquake. Myth: Disasters are random killers. Reality: Disasters strike hardest at the most vulnerable group, the poor - especially women, children and the elderly. In the June edition on TMD* , Ruth Wraith and Rob Gordon from the department of Child and Family Psychiatry at the Melbourne Royal Children's Hospital. The idea of panic involves two things. First, loss of control leading to unthinking, impulsive behaviors; second, selfish concern to save oneself even at the expense of others if necessary. Experience and research show that panic is very rare in disasters. Myth No. 2: In the face of personal danger, people only think of themselves. This is a popular theme in fictional disaster stories, where the selfish behavior of most is a backdrop to the hero`s generosity. However the majority of people in disasters, behave with responsibility and concern for their neighbors. Myth No. 3: Too much information is likely to scare people into behaving erratically. The evidence is that the majority of people react responsibly to the information they are given. Myth No. 4: People do not react with severe emotional disturbance when there is no effect from the disaster on them. Serious mental disturbance occurs in only a very small number of cases. The majority of people employ the strengths and skills they have and meet the demands of the situation. Myth No. 5: Children are not affected by disasters. Myth No. 6: That a community affected by a disaster will fall apart or never recover. Communities that are not completely obliterated by the disaster, reconstruct themselves and gradually assimilate the disaster into their history, and continue a process of development. Communities, like healthy people, have a capacity to adapt to dramatic events and go on with life. Myth No. 7: Workers in the disaster situation are not affected by the disaster. Anybody entering the disaster setting becomes involved in emotionally powerful experiences. Seeing the destruction, hearing people's stories, the stress and confusion of the situation, all place heavy demands, if not recognized and dealt with, can result in health problems in workers or their families, some of which may not show up until a considerable time after the event.